The invention of the Fresnel lens was an enormous technological breakthrough in 1820 that affects us today – for example, in theater lights and car head lamps. These lenses revolutionized lighthouses and saved countless lives. The lighthouse lenses are not in widespread use now and are rapidly disappearing through vandalism and neglect. Not much is known about working on them, which makes the educational aspect of the lens restoration very valuable. We want to record and disseminate this information as thoroughly as possible, to make it possible for others to care for and, hopefully, restore other lenses. Research tells us that our lens is one of only three lenses in the United States made by the English firm of Chance Brothers. It is in very good condition and needs little mechanical work. Restoring the Fresnel lens and putting it back into operation preserves a significant piece of our maritime heritage for future generations. It is the heart of the Point Cabrillo Light Station. The order of a Fresnel lighthouse lens reflects its size. First order lenses are the largest. Our lens is a third order lens. The phrase lighthouse keeper conjures a romantic image of stalwart men and women braving storms and a solitary life in remote outposts. There are still many lighthouses in operation today, but the transistorized NAVAID panel, automated lamp changers, and other electronic innovations, have made the profession of lightkeeper virtually obsolete. In 1972, our own Fresnel lens was disengaged, and an aero-marine type rotating beacon was mounted on the roof. 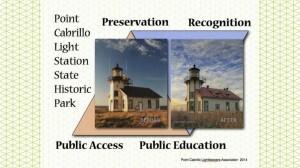 At the Point Cabrillo Light Station State Historic Park, lightkeeping has made a comeback. Since the return of the Fresnel lens to service in 1999, the volunteer lightkeepers from Coast Guard Auxiliary Flotilla 87 have been trained to perform maintenance on both the lens and lantern room. Reviving the Fresnel as a modern, automated light was no easy matter. It had to be made as reliable as the DCB (Directional Code Beacon, commonly in airports), which had replaced the Fresnel in 1972. Advanced technical support is provided as needed by the US Coast Guard Aids to Navigation Team. The Point Cabrillo Light House combines 19th century technology with the sophisticated electronics of today, and was nurtured to fruition by the lightkeepers’ finest attributes: a passion for detail, creative problem solving, and copious elbow grease. The restored Fresnel has operated reliably since 1999. It’s only a little finicky, requiring, as it did in the past, some human care and attention to keep it happy. Every week, the protective storm window panes of the lantern room are checked and cleaned, surfaces dusted, and brass polished. Quarterly, the lens is shut down for a complete mechanical check and a thorough cleaning.